Dine with the Deanguin at the Harbison SONIC! East delicious hamburgers! Have a Berry Slush! See a grown man acting like a complete idiot in a penguin costume! Come out to the Harbison SONIC Wednesday! Students, drop by before heading to Eastlake! 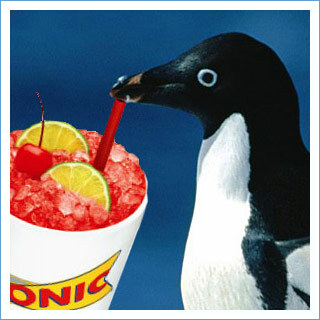 10% of earnings (and all tips) between 5 and 8pm go to Penguin conservation. Awesome!